Who's the most important person in your film - the Director? The talent? The Producer? All pretty crucial, yes, but what about the audience? We believe that your audience is absolutely central to your film. And audiences are changing. Film fans are no longer content with just rolling up to their local multiplex at the weekend for date night and trying to find that elusive crossover movie that they both like (kinda). It’s complicated. Your fans are not just passive viewers. They're your co-writers, your half-way therapists, your pals. Now, film fans want to get involved with your film from the beginning. They want to choose the character's outfit, contribute to the budget, and see how the shoot's going. They want to be involved... and then they want to watch your (their) film. Imagine releasing your film online or selling it to a distributor? Now imagine that again but with an army of engaged fans already attached. Your audience are part of your sales pitch and your business model. 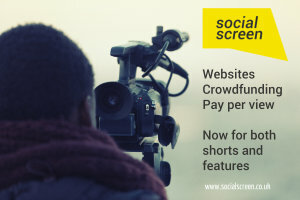 Your Social Screen website is your chance to give your audience a seat as part of your core team right from the start. Use your Social Screen site to grow your mailing list and build up your audience. You’re going to need them.